Lace up your hiking boots and join park rangers for this national celebration sponsored by American Hiking Society. All of Georgia’s State Parks and many State Historic Sites offer ranger-led excursions this Saturday. Choose from dozens of treks for all ages and abilities, like the Ranging Rover Dog Hike at Cloudland Canyon or the Parks After Dark Night Hike at Gordonia-Alatamaha. Let’s hope for sunny weather tomorrow! 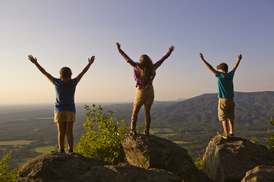 Find a National Trails Day Event near you.